How to get there: We drove from Bergen via Øvre Årdal and across the mountain (toll) road to Turtagrø and across Sognefjellet to Leirdalen. Driving time is between 4.5 and 5 hours. We parked on a turnout about 6km along the (toll) road that runs from highway 55 (Sognefjellsveien) into Leirdalen, this road leads to the famous mountain hut Leirvassbu. Parking is just before the crossing of a river that comes down from the left, also just after the Geitsætri building on your left. The route starts out along the left (north) side of the river, then steeply up the lower part of the ridge that climbs all the way to the Dumhø plateau. After the initially short, steep section, the ridge becomes very broad and the trail climbs a bit to the left of the highest ridge line. We lost any distinct trail before reaching 1500 meter of elevation and continued up along the broad ridge. The upper part is talus, quite loose and slippery when we did this climb. The terrain is less steep above 1900 meter, but continues to climb to about 2060 meter where a small cairn may be visible. You are now on the Dumhø plateau, quite flat. 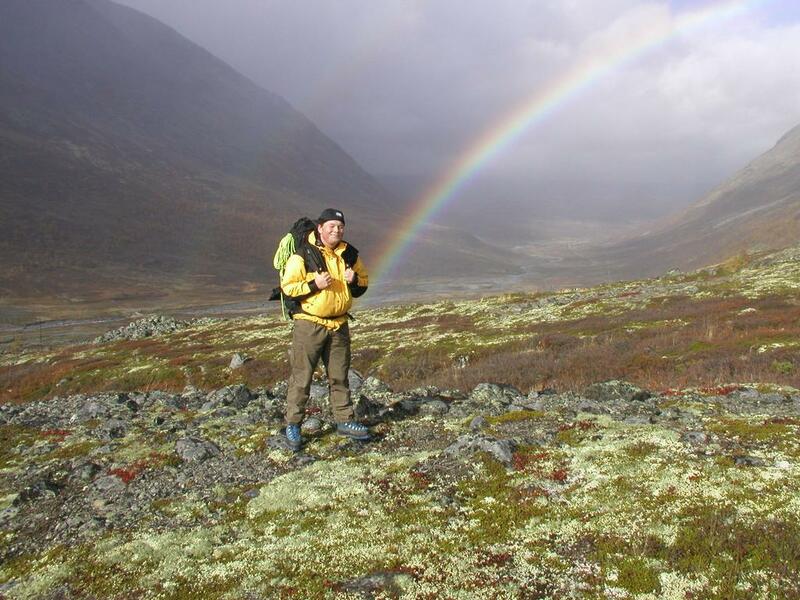 Continue in the direction of the highest point until an elevation of about 2150 meter, then contour more to the right (east) in order to locate the more narrow section connecting the Dumhø plateau with the very small, but distinct peak called Vestre Skardstind. We camped close to, but before this point at GPS coordinates N: 61.38.002 E: 008.14.950 at elevation 2150 meter. In order to describe the route, it is helpful to consider some of the pictures below. In order to establish a frame of reference, consider picture 6 below. 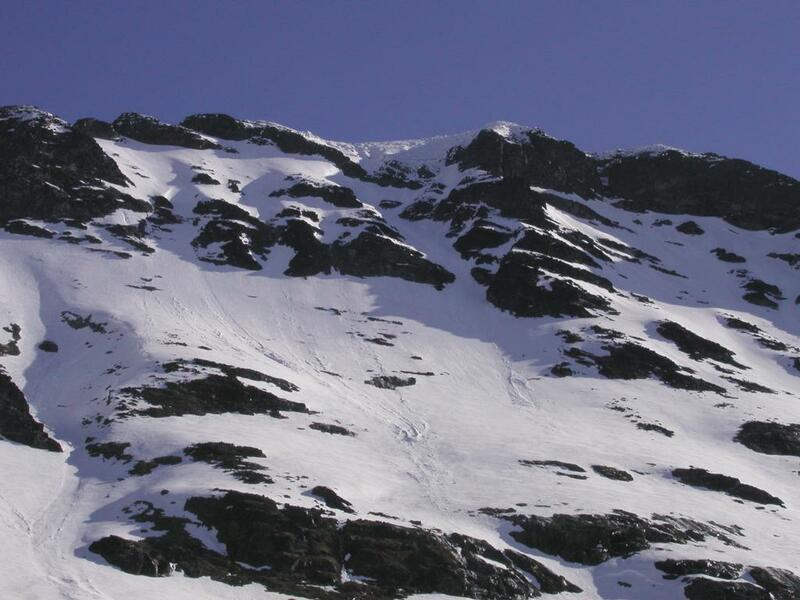 From left to right, we can identify the following: the saddle between Dumhø and Skardstinden, the "rock wall", the south side of the first, steep part of the ridge. Behind (and above) a rocky section in the picture is "the side ridge", a ridge line that extends upwards towards the main (east-west) Skardstinden ridge. Further to the right, near the skyline, one can see a "small cliff" followed by two more distinct cliff bands, "cliffband I" and "cliffband II". 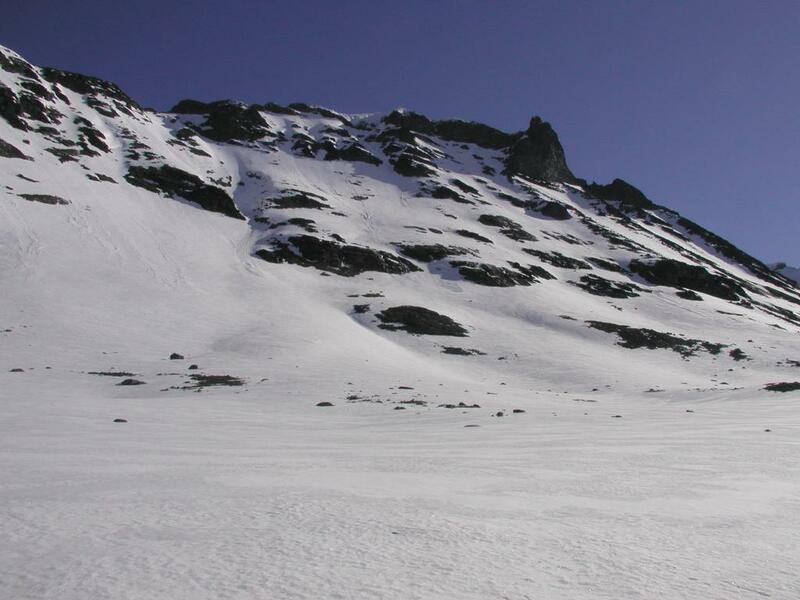 Further right is a snow ridge (the main ridge) to the summit, and finally, far right the distinct minor summit called "Nåla". Several of these features can be seen in more detail on picture 7. In picture 5, the Skardstinden ridge is seen from the north. 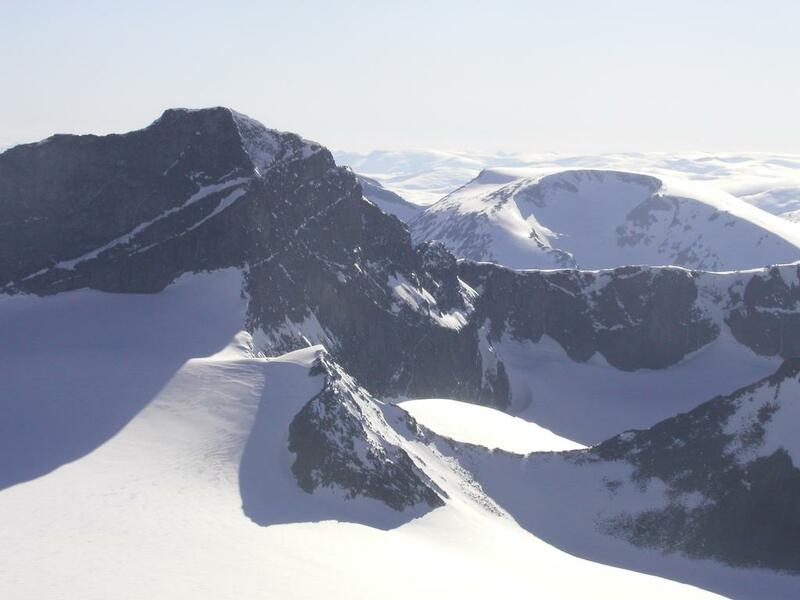 From right to left we can recognize the following: first, the flat part of Dumhø that narrows and ends in the small peak Vestre Skardstind, followed by the small, but distinct saddle before the ridge climbs. The first, steep part of the ridge has the "rock wall" behind, at the top of the following (less steep) section of the ridge one will see the top part of "cliffband I" and "cliffband II". 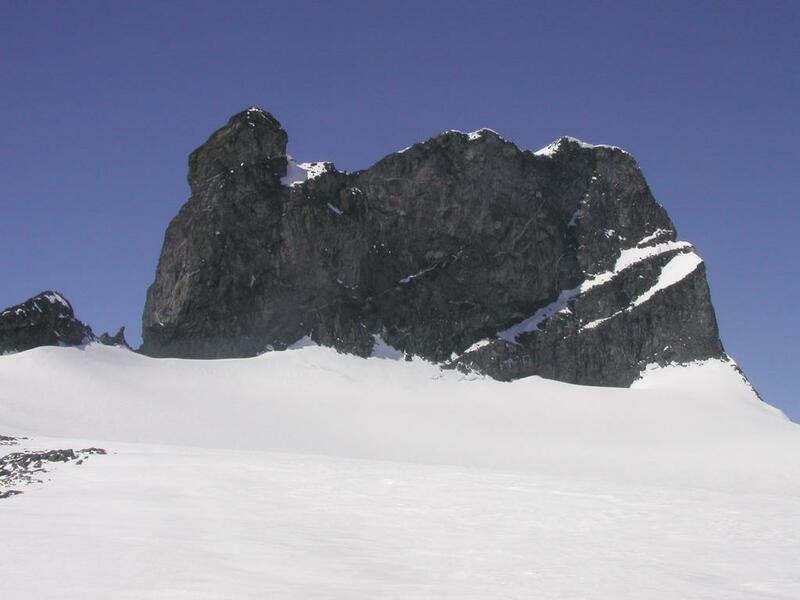 Above "cliffband II", the ridge climbs more gently to the summit of Skardstinden. 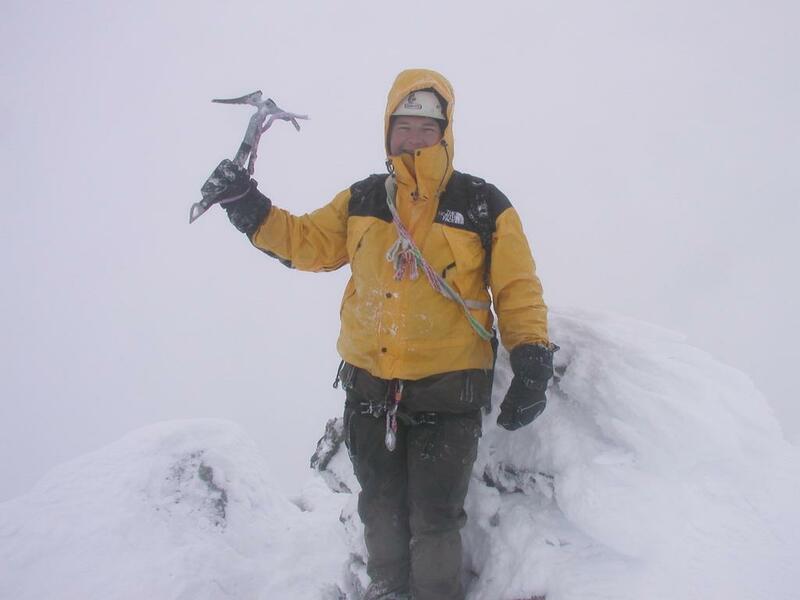 We did this climb in miserable weather and what can best be described as full winter conditions. The following description may reflect this. The route below is a non-technical route, we climbed this without using the rope we carried. Also, the route is well protected without serious exposure. Under winter conditions the hardest section is YDS class 4, additionally there are several class 3 sections. Summer conditions may be slightly easier, but this remains to be checked. From our camp (or the east side of the Dumhø) locate the flat, distinct section that ends in the small (really minor) sub-peak called Vestre Skardstind. Climb this point among large boulders. From this point there is a good view of the main ridge as it rises steeply on the other side of the saddle. Descend, still among large boulders, to the saddle. From the saddle, contour on the right side of the first "hump" on the ridge, then slightly down below the "rock wall". There are several ledges here, stay below these and locate a possible route in a crack near a large rock on the far side. See picture 3 below, here the ledges and the rock wall are up to the left, Jan-Frode can be seen in the crack. The climb up this crack is easy (YDS) class 3. Continue up on a small ridge, stay at this elevation and traverse across a small gully in front of you, in order to gain "the side ridge". This ridge comes from above and continues down. Follow this ridge up among easy rocks and boulders until just below a small saddle in the main Skardstinden ridge. Do not go all the way to the saddle, but turn right and contour just below the "small cliff" that has been described above. Behind this, you will soon locate "cliffband I", this is a slanted, characteristic cliff that comes down from the main ridge. Continue just ridge climbs. The first, steep part of the ridge has the "rock wall" behind, at the top of the following (less steep) section of the ridge one will see the top part of "cliffband I" and "cliffband II". 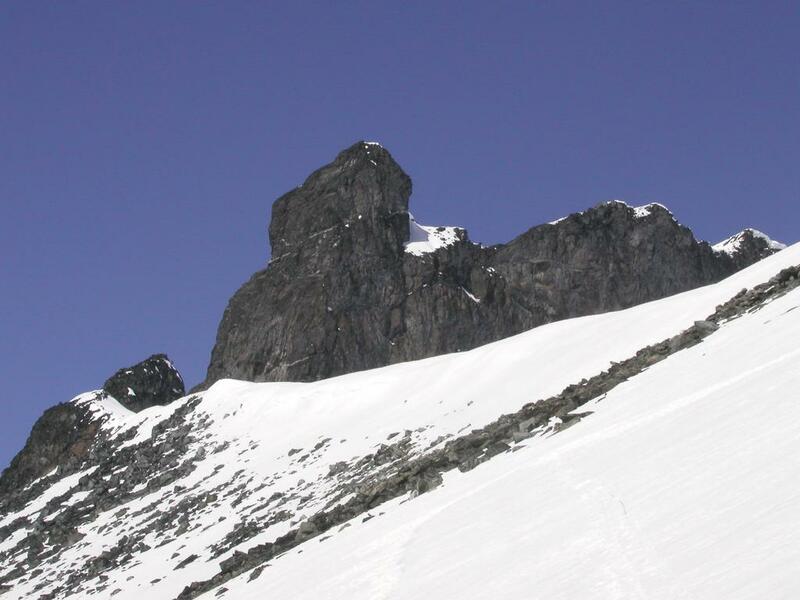 Above "cliffband II", the ridge climbs more gently to the summit of Skardstinden. From our camp (or the east side of the Dumhø) locate the flat, distinct section that ends in the small (really minor) sub-peak called Vestre Skardstind. Climb this point among large boulders. From this point there is a good view of the main ridge as it rises steeply on the other side of the saddle. Descend, still among large boulders, to the saddle. From the saddle, contour on the right side of the first "hump" on the ridge, then slightly down below the "rock wall". There are several ledges here, stay below these and locate a possible route in a crack near a large rock on the far side. See picture 3 below, here the ledges and the rock wall are up to the left, Jan-Frode can be seen in the crack. The climb up this crack is easy (YDS) class 3. Continue up on a small ridge, stay at this elevation and traverse across a small gully in front of you, in order to gain "the side ridge". This ridge comes from above and continues down. Follow this ridge up among easy rocks and boulders until just below a small saddle in the main Skardstinden ridge. Do not go all the way to the saddle, but turn right and contour just below the "small cliff" that has been described above. Behind this, you will soon locate "cliffband I", this is a slanted, characteristic cliff that comes down from the main ridge. Continue just below this cliff, the terrain here is mixed class 2 with a few short class 3 moves. You will subsequently arrive at "cliffband II", a quite similar rock formation, however this continues further down. This location has GPS coordinates N: 61.38.003 E: 008.15.734. Consider this area, if you were to continue below this cliff you would have to traverse a fairly steep permanent snow field or follow the crack between the snow and the cliffband. DO NOT attempt this alternative. Rather, turn left and CLIMB UP along the broad ramp below the cliff (easy class 2). After about 30 meters, locate a distinct, slightly V-shaped cut in the cliff band that goes right and all the way to the horizon above the cliff. The route goes up this gully. It is well protected with minimal exposure. There are two climbing sections, first a very short, slanted pitch, then a slightly longer one. This section is class 4. It is short, but possibly with few and small handholds. The area was covered by a thin layer of snow, it is therefore difficult to know how much easier this section may be in summer conditions. Follow this gully all the way up, then contour around a small rock formation. Behind these rocks, one can easily (class 2) continue up among rocks and boulders. Continue up until the main ridge is gained, then follow the ridge to the summit cairn. The exposure to the north is dramatic. Comments: I did this climb with Jan-Frode Myklebust. Winter had arrived, as soon as we climbed above 1900m the ground was snow covered. Higher up, we had up to 1/2 meter of snow. As the terrain and the climb itself crosses areas with large rocks and bulders, one never knows what will happen with a new step forward. Your leg may stop firmly on a rock or fall (uncontrolled) between the rocks. We hiked up on Dumhø and close to the beginning of the ridge on Saturday in 4.5 hours, camping at the GPS coordinates N: 61.38.002 E: 008.14.950, with an elevation of 2150 meter. The next day we climbed to the summit in about 3.5 hours, stayed there for about 15 minutes before returning to the tent in about 1.5 hours. The straight line distance from the tent to the summit was measured to about 881 meter, while the actual route may have been about 1200 meter. Winter conditions may have hidden foot and hand holds that might be obvious in summer. The weather was very foggy, almost no visibility made route finding difficult. Jan-Frode, we have just started uphill from Geitsætri. 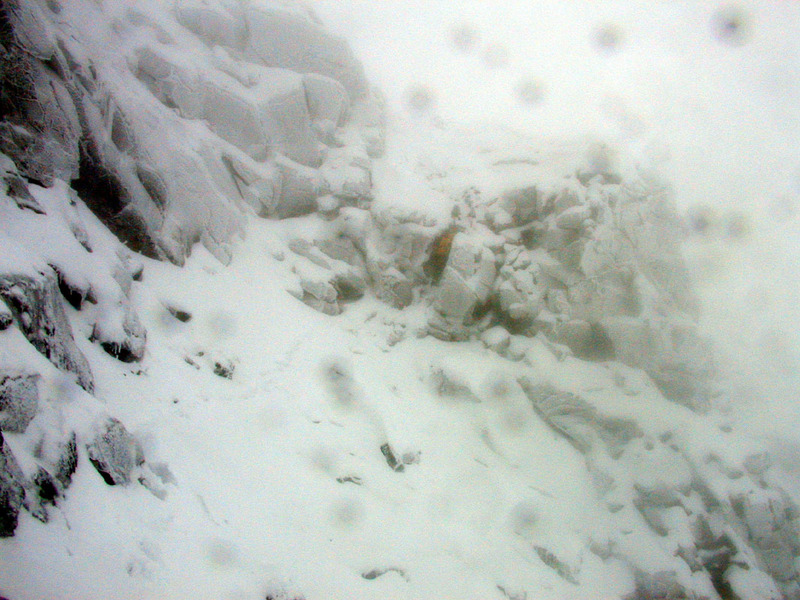 From the route, Jan-Frode is climbing down a distinct crack. 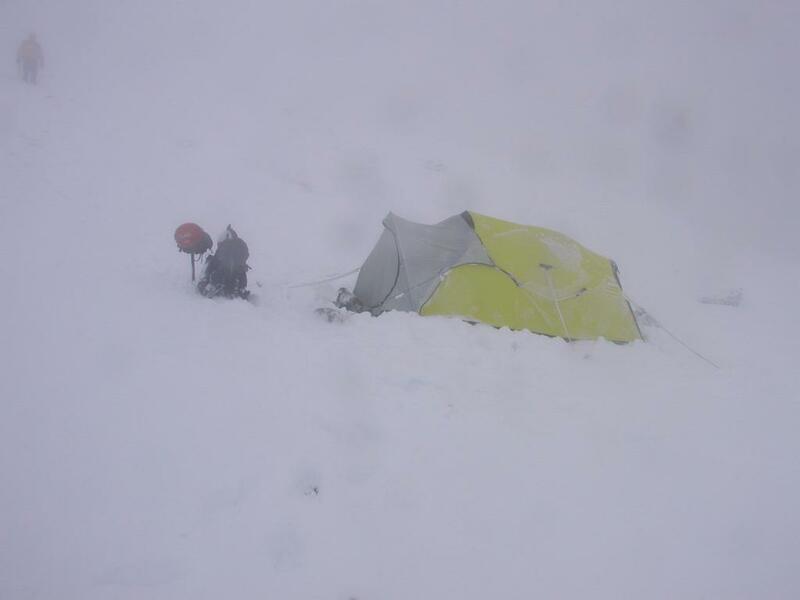 Our tent between Dumhø and the Skardstinden ridge, Jan-Frode is up to the left, returning from the summit. The Skardstinden ridge as seen from the north. The very east part of Dumhø is to the right (flat). Skardstinden as seen from the south. This picture is from May 2002. From left to right: the Dumhø mountain, the saddle connecting to the ridge, the rock wall, the side ridge, cliffband I, cliffband II, the summit, and to the right the characteristic Needle. The route description will refer to this picture. Skardstinden from the south, zoom of the area from "the side ridge" to the summit. Nåla, 2310m and Skardstinden, 2373m as seen from the slope up to Illåbandet in May 2002. The summit is to the far right. Skardstinden as seen from Storjuvbreen in May 2002. The summit is to the right.